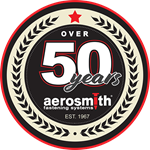 Aerosmith’s on-going product testing and building code evaluation processes require full panel wall and floor assemblies to be built, tested, and measured for wind and seismic resistance. These steps are done through an independent, third-party certified test lab. During recent tests, wall sections using Aerosmith pins were being built next to the same type assembly but fastened with screws. One witness to these very different methods of fastening happened to be the lab’s V.P. of Testing & Evaluations. Upon seeing comparative ‘one to one’ installation of both pins and screws his amazement prompted him to take out a stop watch. He timed each application until full panels were completed. His reaction? Pinned panels went on to meet/exceed screw fastened sample performance. “Aerosmith makes our people faster. We are able to produce the same amount of units with two less people."